During more than a decade of ministry to the poorest of the poor in Mozambique, Heidi and Rolland Baker have learned to expect God's miraculous provision. In this extraordinary book, Heidi Baker draws on her experiences to offer priceless lessons on how God transforms lives. In 2003 readers around the world read in Always Enough about the amazing things God was doing in the poorest nation on earth. Since then Heidi and Rolland Baker?? 's ministry has electrified the body of Christ, lay Christians and ministry leaders alike, who have witnessed it firsthand. Now readers can spend a year with the Bakers, watching God continue to work miraculously in Mozambique and learning how he longs to work similarly in our own lives. 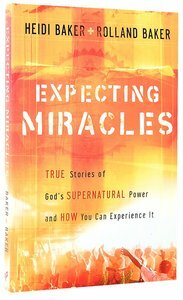 Combining extraordinary narrative with insights and teaching principles, Expecting Miracles connects believers in developed countries with those in poverty and offers priceless lessons on how God?? 's power transforms lives. Rolland and Heidi Baker, natives of Southern California, served as missionaries in Indonesia and Hong Kong before following God's call eight years ago to Mozambique. Facing overwhelming need, the Bakers have seen God provide miraculously for many hundreds of children through their ministry, and many more people through over five thousand churches that their mission has planted in ten countries.